Michael Cohen, the longtime attorney of President Donald Trump, is under federal investigation for possible bank fraud, wire fraud and campaign finance violations, according to a person with knowledge of the case. FBI agents on Monday raided Cohen's Manhattan office, home and hotel room as part of the investigation, seizing records about Cohen's clients and personal finances. Among the records seized were those related to a 2016 payment Cohen made to adult-film star Stormy Daniels, who claims to have had a sexual encounter with Trump, according to another person familiar with the investigators' work. Investigators took Cohen's computer, phone and personal financial records as part of the search of his office at Rockefeller Center, the second person said. The broad seizure collected communications between Cohen and his clients – including some with Trump, according to both people. The raid was related to an investigation referred by Special Counsel Robert Mueller to federal prosecutors in New York, said Stephen Ryan, an attorney for Cohen. Ryan called the tactics "inappropriate and unnecessary," saying Cohen has "cooperated completely with all government entities, including providing thousands of non-privileged documents to the Congress and sitting for depositions under oath." Among the records seized by investigators were "protected attorney client communications," Ryan said. On Monday evening, Trump called the raid of his attorney's office and home "a disgraceful situation." "I have this witch hunt constantly going on," the president said. Dawn Dearden, spokeswoman for the U.S. attorney's office for the Southern District of New York, declined to comment. Peter Carr, a spokesman for the special counsel's office, declined to comment. Squire Patton Boggs, the law firm that formed a strategic alliance with Cohen last year, said in a statement Monday that its "arrangement with Mr. Cohen reached its conclusion, mutually and in accordance with the terms of the agreement. The seizure of Cohen's records was first reported by the New York Times. Under Justice Department regulations governing the special counsel's work, Mueller is required to consult with Deputy Attorney General Rod Rosenstein if his team finds information worth investigating that does not fall under his mandate. Rosenstein, as the acting attorney general supervising Mueller's work, has the responsibility of deciding whether to expand Mueller's mandate to include the new topic or to refer it to a U.S. attorney's office. 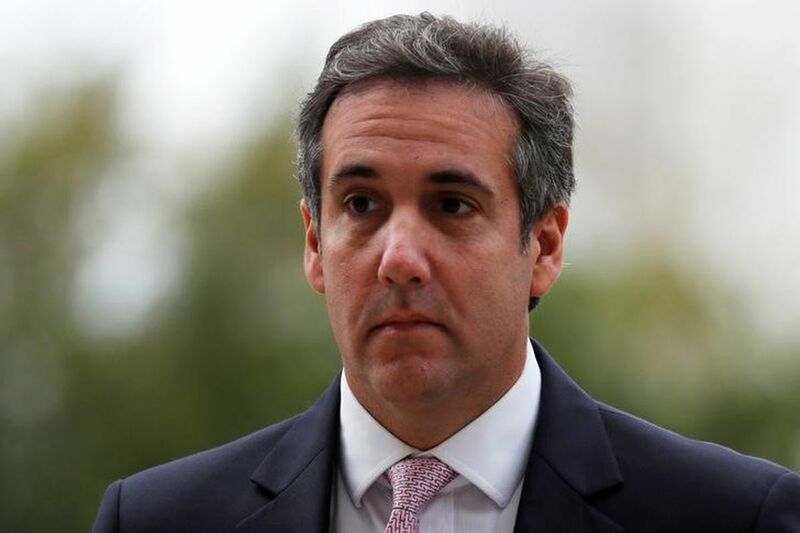 Known for his combative style and fierce loyalty to Trump, Cohen served for a decade as a top lawyer at the Trump Organization, tangling with reporters and Trump's business competitors on behalf of the celebrity real estate mogul. He never formally joined Trump's campaign but was in close contact with his longtime boss from his Trump Tower office throughout the 2016 race and presidential transition. Cohen left the Trump Organization in January 2017, around the time of Trump's inauguration, and since then has served as a personal attorney to the president. Cohen's aggressive tactics came into public view when he acknowledged he facilitated a $130,000 payment in October 2016 to Daniels, who claims she had a sexual relationship with Trump in 2006. On Oct. 17, Cohen established Essential Consultants Limited Liability Co. as a vehicle for the $130,000 payment. Ten days later, on Oct. 27, the bank Cohen used in New York transferred the money to Daniels via a California bank account belonging to her lawyer, Keith Davidson. Eleven months later, in September 2017, that California bank – City National Bank in Beverly Hills – asked Davidson about the source of the payment, according to an email reviewed by The Washington Post. Bank officials declined to comment on whether the inquiry was triggered by a request or subpoena from law enforcement. At some point, Cohen's New York bank, First Republic, flagged the transaction to the Treasury Department as a suspicious payment, according to the Wall Street Journal. Cohen used his Trump Organization email in negotiating the agreement with Davidson and in communicating with his bank about the funds. In February, after a watchdog group filed a complaint with the Federal Election Commission, Cohen released a statement saying he "used my own personal funds to facilitate" the payment. He rejected the idea that the payment should have counted as a campaign contribution. Trump made his first comments about the payment last week, saying he did not know about the transaction. To pursue criminal charges against Cohen for breaking federal election law, prosecutors would have to prove that he made the payment to influence the election, rather than for personal reasons – to protect Trump's reputation, for example, or his marriage to Melania. While the timing of the payment – 12 days before the presidential election – might suggest an attempt to influence the outcome, timing is not enough to prove intent, said Rick Hasen, a professor specializing in election law at the University of California at Irvine. "It would be very difficult to bring one of these cases without some good documentary evidence," he said. "I think a lot of people are underestimating the hurdles that it takes to bring a criminal prosecution." The Washington Post's Devlin Barrett, Mark Berman, Emma Brown, Josh Dawsey, Rosalind S. Helderman, Beth Reinhard and Philip Rucker contributed to this report.